Record Lectures 3.1 – Record class lectures. Record Lectures was built with the purpose of allowing anyone who records lectures, meetings, or conversations to be able to store them in a calendar and be able to share these recordings easily. Record Lectures is a must have app for everyone who is going to school or attends conferences or meetings. 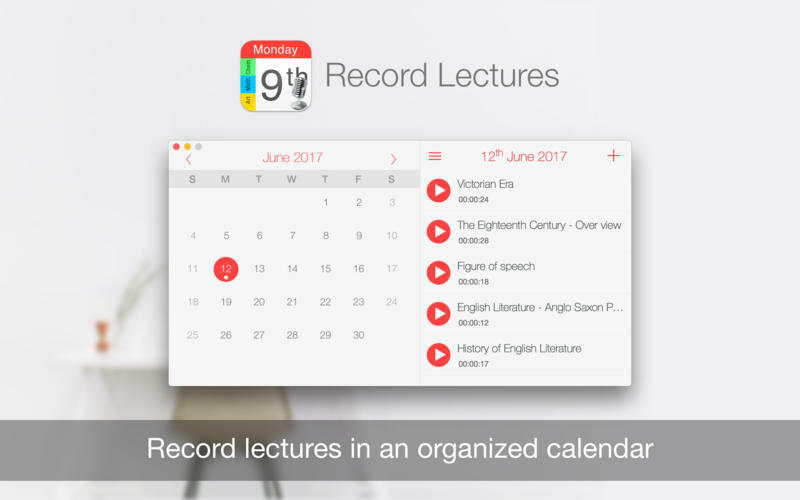 Record Lectures allows students and business people to record and file lectures and presentations into a neatly organized calendar marked by subject (topic). The simplicity of operation of this app truly makes it a great tool. Seeing the lectures noted on the calendar for reference certainly makes it really organized and easy to find again and play back. Timestamp can be added to notes now. Next story AnyMP4 MP4 Converter 6.2.61 – Best Video Converter. Previous story Moneyspire 17.0.34 – Comprehensive, user-friendly personal-finance software. Record Lectures 2.6.0 – a must have app for everyone who is going to school or attends conferences or meetings. Piezo 1.5.10 – Quickly record audio from any application. Record Lectures 3.0.1 – Record class lectures.